The 2019 Winter CSA membership contract is now open and starts on Saturday, January 5th, 2019. 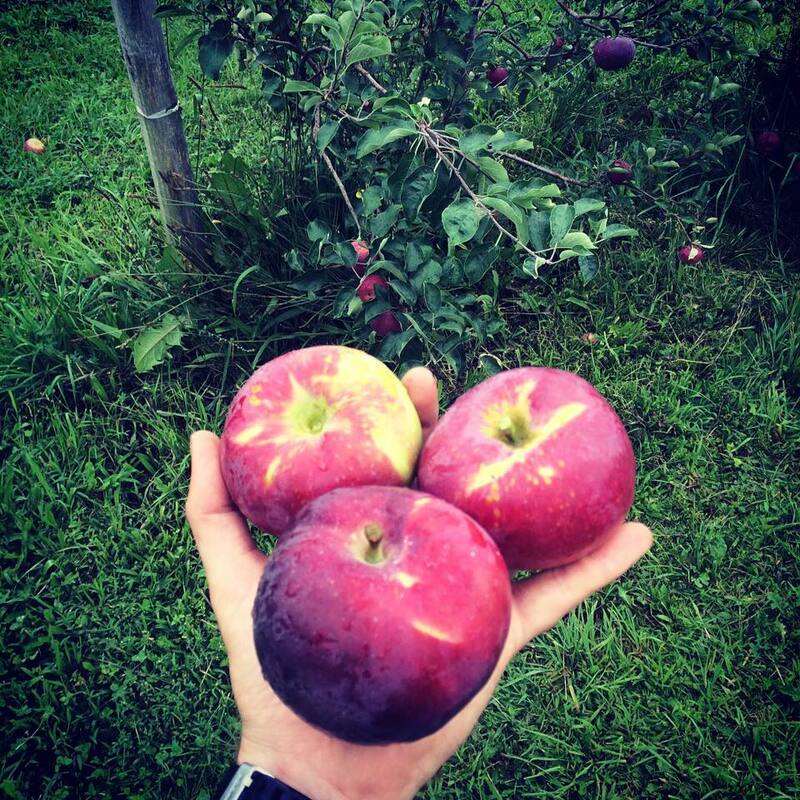 Middlefield Orchard offers a Winter CSA for both fresh and processed food, and for the regular season a fruit CSA, a vegetable CSA, and combination of fruit & vegetable CSA for the 2019 season. We look forward to serve you during the upcoming season. You can also find us in the Cooperstown farmers market, Saturday from 9 am to 2 pm and the Oneonta farmers market, Saturday from 9 am to 1 pm year-round. Our new facility is well underway. The outer structure is up, the cement flooring is complete, doors and windows are installed. The facility will contain a storefront, kitchen for processing our fruits and vegetables, a cooler to store the produce and a hydraulic press for making apple cider. The four area functions will be completed over a period of time as we can afford to complete them. 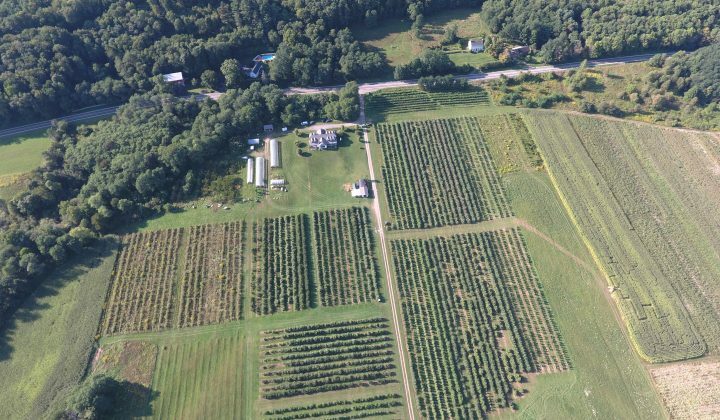 "If you wander around the 80+ acres in production at Middlefield Orchard near the end of August, you may start to get the sinking feeling that the growing season is almost over and any day now storage crops will be our only option. Many beds have already been harvested and turned over, ready for a winter's sleep. Weeds are beginning to overtake the rest because soon they will give their final harvest as well. But then you pass the raspberry patch where branches are inches from the ground, heavy with green fruit still on its way to ripening in the coming month. Down a ways the rhubarb plants are almost ready to make their fall comeback. 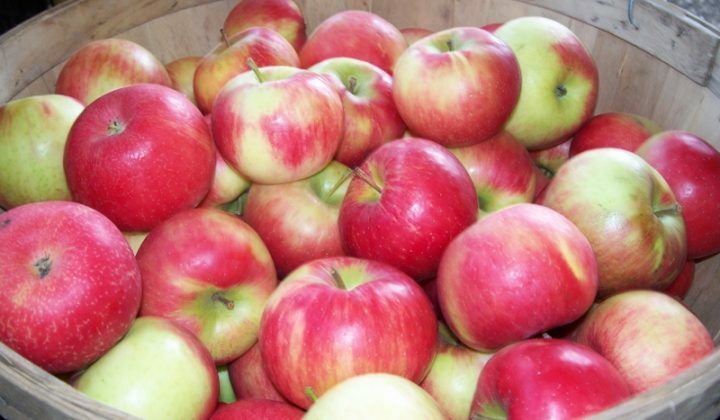 You look beyond the Pristine and Zestar apples which are currently at their peak to see the Gala, Blondie, Honeycrisp, Macoun, and others that are still yet to come. Finally, you notice the steps of corn, planted in waves, the youngest ones still only 12 inches high with plenty of time to grow their sweet ears, and you realize the season is far from over. 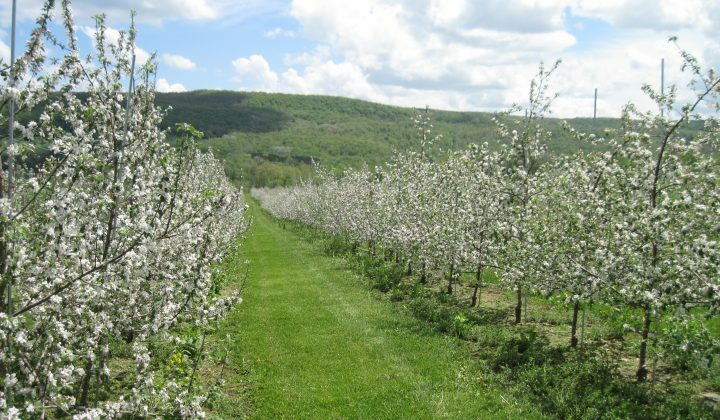 Many people consider September to be peak harvest in our region and with 10,000 apple trees tilted like the Leaning Tower of Pisa from this year's bumper crop, no where is that more true than at Middlefield Orchard. Believe it or not, there was a time when no one had ever heard of a Honeycrisp Apple. It was back in the day when Willy and Joan Bruneau had a mere 1,000 apple trees and sold their humble crop from a small table at the back of the market. Flash forward fifteen years and Honeycrisp might just be the #1 apple variety in the country while the Bruneau's have expanded their offerings to include vegetables, baked goods, honey, and preserves, making them one of our largest vendors attending market every Saturday, year round. 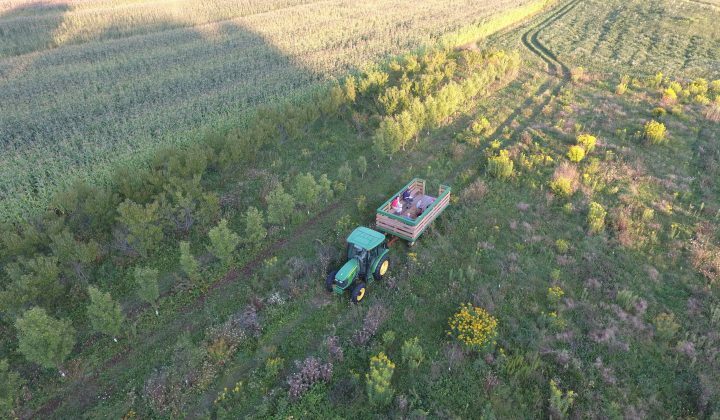 You would think additions like an automated mower with sensors that allow it to cut between the trees while avoiding the trunks to replace the task of weedwacking an entire orchard by hand 5 times a year would allow for some welcomed leisure time. Instead, Willy and Joan have decided to continue expansions by breaking ground on a store front complete with a commercial kitchen and hydraulic cider press. If you mention retirement, Willy simply smiles and states, "I am retired." Dig a little deeper and you'll learn that he truly believes working the land is one of the only things keeping him alive and well. This isn't just a business, it's the life they chose with purpose and there is no end in sight. 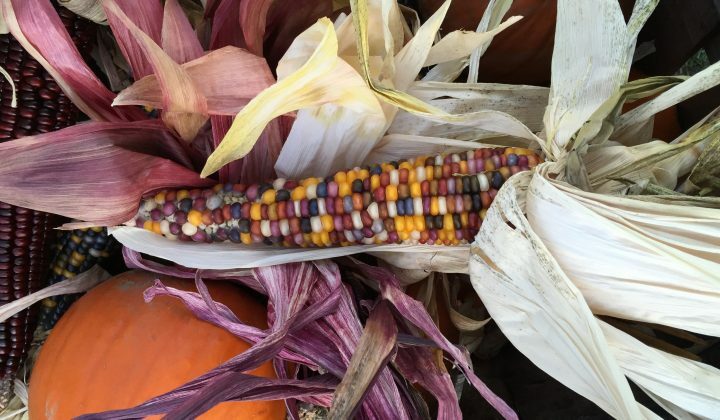 They will be planting, harvesting and building as long as apple picking and corn maze adventures remain at the top of everyone's to do list on breezy fall weekends." We offer a large variety of fresh vegetables throughout the season at our farmers markets and at the orchard. If you or your family eat a lot of apples or process any apple products this is by far the least expensive way to go. The Rent-a-Tree program is not accepting any new contracts for the upcoming season. A Farm Safety Plan is now implemented for any and all visitors to the orchard to enhance the safety of all concerned. Hand washing stations and instructions are easily located for your convenience. FRESH FRUIT & FRESH VEGETABLES at any of our markets in Cooperstown (Sat 9 am to 2 pm) year round, or Oneonta (Sat 9 am to 1 pm) year round, or Delhi (Weds 9 am to 2 pm) June through early November. You may sign-up for our seasonal CSA program by printing and filling out the contract form located on the bottom of the CSA page or pick up a contract at one of our markets. Click on the CSA button on the left hand navigational bar and scroll down to the bottom of the page. The orchard will re-open Saturday, June 29, 2019 through Saturday, November 2, 2019.